Contact Us and Become a Partner! Stop the deforestation of the Amazon Rainforest! 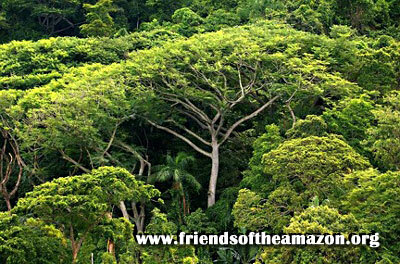 Support the Friends of the Amazon's goals to put an end to the destruction of the world's largest rainforest. You can be part of the solution and become a partner in this vital cause. Most people do not understand that the survival of the Amazon is vital for the survival of our planet as we know it. Scientists estimate that the destruction of the Amazon Rainforest would increase the amount of carbon dioxide in the atmosphere by as much as 20%, wreaking havoc on climate change, weather cycles, and increased global temperatures. The world as we know it can not survive without this vital ecosystem which contains more biological species than any other place on this planet, many of which have not yet been discovered and recorded by scientists. Many of the plant species from the Amazon Rainforest are the original source of vital medicines that we all use. In fact, many yet undiscovered plant species from the Amazon may contain medicines that could cure cancer or other diseases. It would be a great tragedy for us to destroy these species of plants containing new medicines before they are even discovered. For these reasons, the survival of the Amazon Rainforest is vital for the continued existence of our species on our planet. In addition, few people realize just how fragile tropical forests are due to their highly weathered, ancient soils that lack the ability to retain vital nutrients. The essential nutrients in tropical ecosystems are all in the trees, and when you cut down the trees and remove them, you take away all the nutrients. Reforestation in tropical forests is very slow, often taking centuries for a deforested area to recover to its former old growth forest. For more information on our how your can form a partnership with us or to find out how you can save the Amazon Rainforest from destruction, please contact us using the email address listed below.